What does a used bookstore lady do when she has two days off? 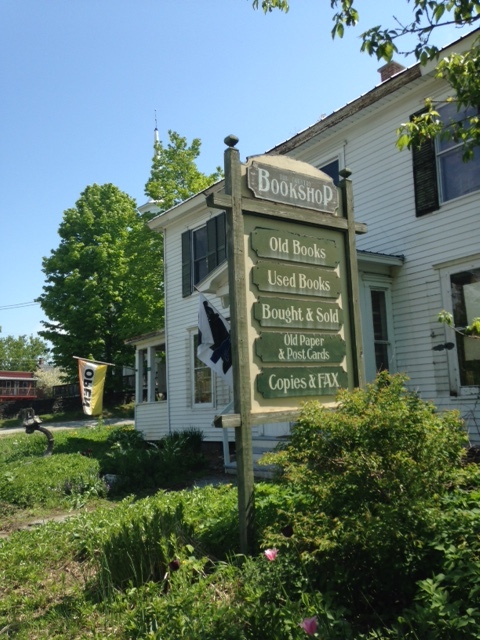 Of course….visit another used bookstore! Rusty and I found ourselves heading northward and I remembered, “Hey! Ben’s having a 50% off sale! Let’s check it out!” So we did. Each used bookshop I visit I find that it totally reflects the owner. How can it not? [Yes, I wonder how my shop reflects me! What am I saying about myself? Curious.] 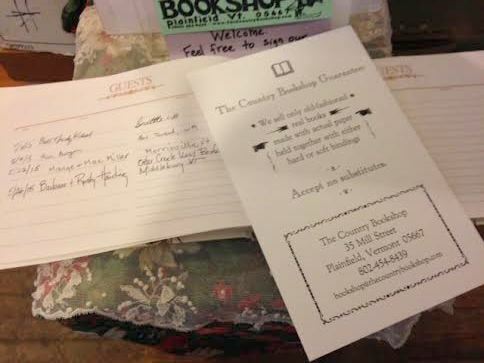 The Country Bookshop [35 Mill Street, Plainfield, VT] is so Ben Koenig. And I mean that in the most respectful way. He has the best sense of humor and a broad knowledge of the used bookstore world – business and books. And knows his customers. I’ve always wanted to visit him in his world. Unfortunately he wasn’t in that day as Sundays are his day off. Mine, too. Lucky for him he has a great employee, Frances, who was minding the shop for him. We had a great conversation about books, the internet, and working in a used bookstore. I took advantage of his generous sale and left with a good stack of books to bring back here to the store. (Another way how we get inventory.) In fact, Ben, was the one who stated at a Brick & Mortar meeting that if you are going to have a sale why not make if fun for everyone. Make it 50%! So I do. And yes, it is a lot of fun. And a good way to move around inventory as well. When Ben is having a sale there are a zillion signs around proclaiming that one is going on. 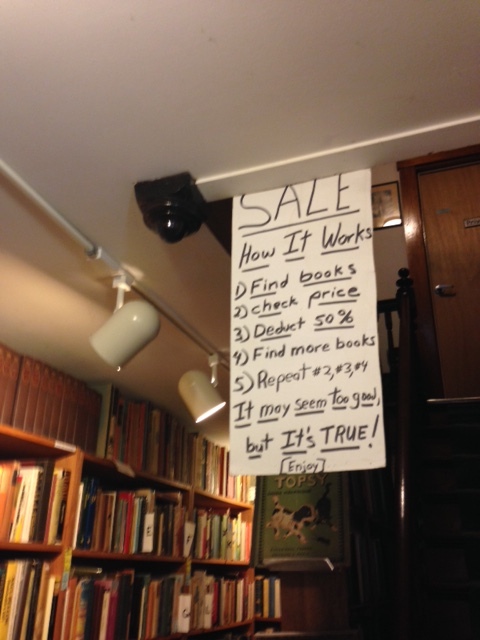 Here is one: It’s gets me how the sign states “It may seem too good but it’s true!” When I host a sale I get people coming up to me asking if ALL books are 50%. I guess it does seem too good to be true. But it is! That’s where the fun comes in. Seeing the joy over the book buyer’s face with the realization that yes, the books they have in their hand is indeed half off. The next day, Rusty and I hiked Buck Mountain. It’s been on our bucket list for years. We decided to tackle it as the first hike of the season. 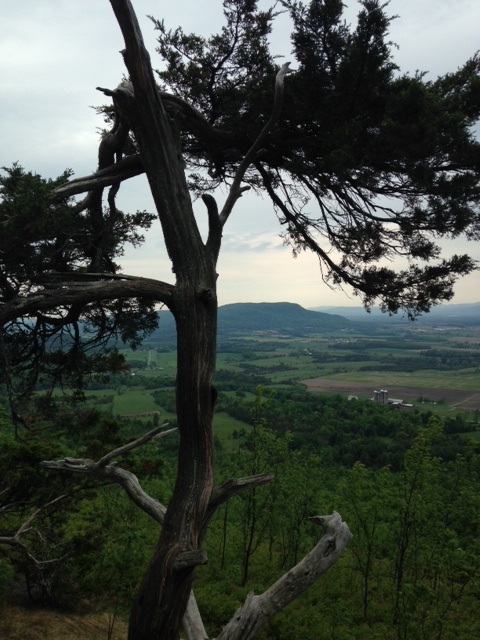 A wonderful climb with an amazing view of the lower Vermont Champlain Valley.